One of the main themes that Dallas kept reminding us was in the simple statement, “The results do not depend on us”. It could have been my imagination but it seemed that every time he made an allusion to that, the room winced. I did because that line has a spiritual older cousin – the “Give it to God” cliche. Only it isn’t a cliche when Willard mentions it. Shane Hipps said something similar regarding his preaching during one of his presentations at Poets, Prophets and Preachers in Grand Rapids last year. He preaches it, leaves the words and doesn’t think about them the rest of the afternoon. From the illustration he wanted to use (“Forget about it”), the awkward wording (“Don’t regret about it), the key line that he had been waiting all week to say (“Well there’s next week”). He said he is allowing himself to enjoy the freedom of releasing the message and allowing the Spirit and hearts to work. I, of course, find it compelling to feel that way. The results-problem is not a new thought for anyone. I know I have spent a lot of time throughout my 10 years of ministry dwelling on this very point. How do I release it without getting lazy? How do I care without caring so much? Was Jesus not disheartened when the crowds rejected His words or was the line “He who has ears, let him hear” really enough to release Him from the results? There is a skeptical nature that I have towards Dallas’ words. We all know of a church that enables its pastors because he’s getting people down the aisle or he’s getting the new education wing built or whatever result justifies inappropriate behavior. Missional pastors who try to avoid these types of standards tend to focus on subjective matters like feedback that reflects actions of a transformed heart or the support of a others-centered project. These are arguably our altar calls and education wings. I’m not saying this is wrong, I am just looking in the mirror and finding the obstructions in my vision. Further, this post can easily get into the unfair standards that pastors are often judged (as I just demonstrated three short paragraphs ago ;-). But this is precisely what Willard’s wisdom is offering to help. Realizing the results do not depend on us as pastors becomes an issue of submission and trust in the Holy Spirit. How do we prevent from becoming lazy and unattached? My best answer is as we live Spirit-led lives following Jesus, we live faithfully to the calling we have received. While this does not mean that one should allow themselves to be abused by the church, it does confirm that we are intentionally focused on living a life that prioritizes pleasing the Father over people. So, as it is true for all of us in our various vocations, callings and walks of life – may the Lord judge us with justice and mercy as we walk humbly before Him. As mentioned in post 1, like so many, I have a high regard for Dallas Willard. How an 74 year old man refreshes these words to a 33 year old is amazing to me. Yeah, he’s on a high pedestal for me (and many others) but it’s not without good reason. As I have been processing this throughout Lent, the themes of Discipleship and Evangelism have repeatedly come up in my church community, seminary to some extent, and in my own mind. Discipleship is a term I have always been endeared to. I am sure I have said numerous times, “We need disciples, not just converts.” which depending on the attitude towards Evangelism can also sound like, “We don’t need anymore new Christians until we fix the old bad ones.” Perhaps that is a bit overstated but you get the picture. Once in a job interview, I was asked to define discipleship. I said something like, “Christian Discipleship is the Spirit-led, lifelong process of following and becoming more like Jesus to give glory to the Father.” I threw her off at Spirit-led. I think my next response was, “No I do not think anyone would accuse of being “charismatic” in worship expression sense.” The next question was, “What is your discipleship program in your youth ministry look like?” I went on to explain that incorporating the themes of worship, learning, serving and creating community in youth ministry is discipleship. She asked, “Yeah but what program do you use?”. By then I knew I wouldn’t get the job. When I listen to Dallas talk, I regret that I am not able to recreate his holistic (overused term) approach of terms like discipleship and evangelism to the scope of the Christian life. What does my/our evangelism program look like? Given my aversion to “programs” (Evangelism Explosion! ), I hope it’s the practice of living and proclaiming the gospel in our everyday life. Indeed, sometimes it’s overt and sometimes it isn’t. It’s interesting to examine Jesus in the Gospels – like John 6 is very overt (“I am the bread of life …”, many left) & John 8’s woman caught in adultery (“Go and leave your life of sin”) or even more, John 9’s healing of the blind man, (“Go and wash in the Pool of Siloam”). Umm, where are the altar calls? Why aren’t Peter and John singing, “I Surrender All”? How about a pledge card so someone call follow up or something? Is that really “evangelism” – just going around helpin’ & healin’ people? Hmmm. The question of “What is the Gospel and its lower case younger sibling, “What is the gospel” (maybe more on that another time) are questions and thoughts that have occupied a lot of thought and conversations, including my senior pastor. I continue to be grateful that we serve together as bring our own emphases to such important the conversations. One thing that was renewed to me at Ecclessia is that these conversations need to be more in the forefront of my ministry. Part 3 is about not relying on ourselves and the work of the Holy Spirit. Should have it posted later this week. As always, thanks for reading. A month ago, I attended the Ecclessia Gathering in Chevy Chase Maryland. While I had heard about it for a few years, it was my first time there and was grateful that a good friend made it possible for me to attend. However, the timing was especially terrible for me. I had just returned from our Sr. High Winter Retreat (which went very well), was missing my family (who are fabulous) and was still recovering from my stolen Macbook and various other complications (which is life). I went for two reasons, as much as I missed my wife and kids, I needed a few days away, and two, Dallas Willard. Like probably everyone at Ecclessia, The Divine Conspiracy was life-altering for me. What New Kind of Christian and Postmodern Youth Ministry was for me in my mid-twenties, Divine … was for me in my college years. I’d say now that God used New Kind and PYM to “save” me in ministry and that He used DC to save my understanding of Jesus and thus, my theology. Divine Conspiracy came at an important time for me. It was further aided by the preaching of Pastor Mark at the Grace Church in Lynchburg, VA. He referenced Willard and Foster a lot and I am pretty sure the entire church was reading them as part of his influence. I remember leaving Grace naively thinking, “Yeah, churches read the same books as their pastors.” Uhh no, not so much. Now I think he should lead a conference on that – lol. Anyway, Willard is the man. I’ve been looking over my notes as part of my Lenten reflections and am in the process of reflecting longer on the notes I take from conferences, school of course, and life in general and here are a few observations that have either remained in my mind or have been difficult to dismiss a month later. In addition to Dallas, there was another pair of main presenters and they were the incredible couple, Bob & Mary Hopkins. They are considered to be the pioneers of church planting of the last 30 years in Europe. To quote from the conference program, their project Fresh Expressions “is an Anglican church-sanction movement that encourages new forms of church for a fast changing world …” creative expressions were very helpful for me. While it is true everywhere, being in the northeast, I think all of us need to reimagine different expressions of church-life. I’m still working on these but find myself thinking a lot about them in relation to my current ministry. I hope to post on Willard’s and others’ thoughts later this week. In the meantime, you can check out what other pastor-bloggers wrote here. – Dylan has been rolling over! – Already using very bad words, Nathan is living out the pastor’s kids stereotype. He’s having trouble saying “Truck”. What can you do? – Susan is very concerned (Oh and church nursery workers are meeting with the elders tonight). – I am a proud parent – come on the kid is talking! – Fantasy Baseball draft is tonight. 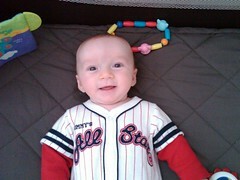 It’s a long baseball season, hoping for a good draft. – Last week I got to have lunch with a couple youth pastor friends. We’ve been meaning to for a while, it was worthy the work and waiting. Some good people serving around here. – Lost! I’m right on the border of being impatient & irritated and sheer suspense. Btw, loved this Homebrewed Christianity podcast that was about Lost. Chris Seay, pastor, author, dude just released a book called The Gospel According to Lost. He’s done a couple of these books like one on Tony Soprano and another on the Matrix. He’s also one of the pastors who begain the Advent Conspiracy experiment – good guy, good thinker, good stuff. – 24. I’m back on it like it’s 2002. – The Office – the baby episode was the funniest I have seen since, what – 2002? Some new music, like Johnny Cash American VI and whatever was in my Paste Sampler. Also, downloaded Broken Bells when it was on sale for a couple bucks on Amazon. It was worth it – I need a few more listens to comment more. Not what I expected in a good way. Still listening to Jim Belcher’s Deep Church on my way to school. I am enjoying it; I find many points of agreement and a couple points of respected disagreement. Hope to offer a few thoughts in the future. Always listening to the Relevant podcast. Beyond Culture – by Edward Hall for a new seminary class on Culture. – Sent out letters for our mission trip to New Orleans. The other week I mentioned that some know they are coming and asked they pray about it first. And a long time ago, some decided not to go and I asked that they pray about coming. Either way, I hope it’s after prayer that we decide to join or not join this trip. It always leads to a better trip and a better attitude as a whole in our group. – Some are also participating in organizing and packing clothes for Haiti and then next month, there is a local clean up day in Montvale. In Sunday School, we are discussing how the Bible was put together. A little nerdy but it’s interesting. We Christians should know how our holy book was put together. – This week’s Second Mile service. The message is entitled, “The Gospel According to Superman, the Simpsons and Starbucks”. Everyone has a “gospel”, how do they contrast to the Christian one? Further, have we as Christians settled for a weak “Gospel” or are we truly living out the Gospel message? We are meeting in the balcony this time and hoping it works better for us as a gathering spot. – Visiting Susan’ family next month as a family. It will be our first family vacation with the 4 of us. In fact, the last time I flew to FL, we didn’t have any kids. – the NT Wright Theology Conference at Wheaton next month. I ended the last post by stating that my greatest hope is that we seek communion with God, Himself. Thus, I do believe in things like evangelism, mission work, serving others, etc. This brings us to the “social justice” discussion. For various reasons, this is a tricky term. Those who have been raised in evangelicalism tend to dismiss the idea of social justice as liberalism. The charge is often made that these types of advocates only want to help people for the sake of this world and disregard the message of Jesus or salvation, etc. For me, I want to preach a Gospel that can be accepted or rejected. God has given us the free will to make accept or reject His grace. No I am not a Calvinist (further, Calvin himself didn’t seem to be a good one either). The gospel can be rejected. When I read passages like John 6, I see Jesus allowing people to leave him. Earlier in that chapter, He feeds the 5000. The next day he crosses the lake, the people follow and to paraphrase His preaching, He says, “You have come looking for the temporary things of this world (bread and more signs in this case), but I am the bread of life.” Upon hearing this, many left feeling disappointed and confused. In fact, among the few that stayed were already His disciples. It’s always been so interesting to me that He still fed the masses the day before. Being Jesus, He must have known how this would have happened. My western mind could think, “Wow, that was inefficient.”, or “Quick say something less confusing so they stay longer!”, “Levitate or levitate them so they know that you are the Messiah. Do something so they don’t leave!” Jesus doesn’t do any of that. The Gospel can be rejected. It’s not the Gospel if it’s manipulative. It’s not love if it’s forced or coerced. It’s not the abundant life if it’s been demanded against my will. I am sure that Jesus wanted every one of those 5000 people to stay, believe, and become His followers. But as John 6 records, many of them left and He let them. That’s the Gospel. It feeds people, helps them, even heals them, with no strings attached. That’s also justice. Being righteous because there is no other way to show that your love is truly without condition then to allow it to be rejected. I am still not sure what Glenn Beck tired to say. I’ve listened to parts of the original broadcast. I’ve seen quotes from his follow up and for the life of me, I do not understand what He’s trying to say. At face-value, it sounds ridiculous. Yes, there are some churches that have sold Jesus short. That has been in many ways, from promoting a preacher-personality higher than Jesus, from creating a community that is exclusive or self-caring, to putting programs ahead of the mission of the Christian faith. But the idea of social justice is a very important part of the Gospel itself. A follower of Christ cannot say to a poor hungry person “Hey, I’ll give you food if you agree to hold my beliefs.” Or to the rich and depressed person, “I would like to offer you the hope of a meaningful life of Jesus, but first, you need to agree with me.” That’s not justice. Throughout Lent, I’ve been reading through the Gospels and every time I read through them, I think, “Wow, if I was Jesus, I would have said things so differently. I would have said more. I would have said less. I would have ….”. The other day I was reading through Matthew and there are a series of healings in chapters 6-8. it’s like Oprah, “You get a healing, and you get a healing, and you over there, you get a healing!” It used to strike me as odd that in numerous cases, Jesus heals the person but doesn’t offer a moral lesson, or a charge to love God, or an offer of repentance. He doesn’t even leave a business card. He just heals and walks away. He demonstrates love, compassion, and grace with no strings attached. That seems like a better way to take part in the “culture war”. If you have been reading along, you know that I have expressed my frustration of the way, we Christians have discussed and engaged in the idea of the “culture war”. I’ve been saying a lot of what I don’t want and in this post I hope to communicate things that I do want. In fact, I hope we all want them. First, let us stop calling it a “culture war”. There is one, I know I get it. I am not suggesting that we call it a “cultural misunderstanding”. I know many have not only been hurt but destroyed, physically, emotionally, spiritually, in every way possible. Not only am I aware of this but my heart is broken for this too. Further, it’s not the violent imagery that I am against. Our Scriptures are full of that type of imagery, “fighting the good fight”, “I’ve come with a sword”, “Our battle is not against flesh and blood”. I am aware of this too. What I am frustrated by is that imagery lends itself to readily to “Us versus Them” mentality. And I find that unloving. The narrative of the New Testament (and you could argue for the Old as well) is that the Christian mentality needs to be “Us and Them” or even “Us for Them”. in good conscience, I cannot sing, “They will know we are Christians by our love” and preach against the culture war. I do not want to create and label any more “enemies” that what we already have. And to those who call themselves as enemies of the Christian faith, we should find ways to reconcile. I suspect it’s true for you as it is for me, when we serve, we do not feel like we are at war. I want to be a part of the momentum created by hope and redemption. I want to encourage people to not only support churches, para-church organizations, and political parties but also support local and global ministries, NGO’s and various charities. Please note that I did not stop supporting the former and choose the latter. Please also note that I do not mean financially only. Imagine what it would look like if we channelled our energy, resources and focus from our many institutions, broadcasts, magazines, newsletters, fundraising etc. to people, projects, and programs that helped the suffering and oppressed. I know that was a long sentence and I know many will dismiss it as naive idealism but this is my prayer. If the last 100 years of conservative evangelicalism was spent on building institutions, subscriber lists and all too often, self-serving programs, may the next 100 be spent focused outside of our walls. One last thing I wish to offer. My ultimate hope is not to alleviate the suffering of the world. As one who also suffers in some ways, I know it is not possible to live a pain-free life. Even if we could, I believe there’s more. My great hope is that people be reconciled to a loving God that sent His Son Jesus to die for our sins and allow us to be reconciled to our Creator. So may the Holy Spirit work through, in and beyond us as we live this hope and mission but I have concluded that people are seldom reconciled in war, they’re further hurt and displaced. Let us do better. More on this next time. I finished the previous post by offering a brief overview to my introduction to the idea of the “culture war”. This post I want to engage in how many of us as Christians have been fighting the culture war. As you saw in the last post, there was a connection between Christianity and political conservatism. While not all Christians have made that same connection, I did. It was a reflection of our Christian faith – to vote conservative. While I will not argue that the right evangelical expression is to vote more liberal/left (or moderate, or not vote at all, etc. ), it is my aim that our faith must transcend our political ideologies. Said another way, our faith can be reflected in our political views but not defined. For me, “fighting” in the culture war did not allow me to see that and I suspect that many young evangelicals can relate. It should be said that some do not actually see a culture war but instead see many expressions of beliefs and practices that some respond with varying degrees of tolerance/intolerance. For our purposes, I will simply use the idea of “culture war” to reference the fight that results between our conflicting ideologies, namely conservative versus liberal, Christian versus non-Christian. However, as the posts unfold, I am more interested in the Christian’s perspective and posture towards the idea of the culture war. From where I sit, I see four typical responses to the way the culture war has been fought by Christians. One is way of the “Conquistador”. They can be the trailblazing missionaries that jump off of boats, planes, and blogs ready to claim soul and land “in the name of Jesus!” You could argue the missions movement of the 19th century was another example of this. You could also make the case the birth of America was rooted in this too but good luck explaining how the treatment of the Native Americans was moral, Christian, or in an sense, acceptable. But those may be subjects for another day. Easier examples might be the more modern versions of the “Conquistador”. Sometimes the Conquistador is an innovator/builder/mogul like a Billy Graham. At its laziest and lamest, the Conquistador is the “copycat” who sees You Tube and creates God Tube or sees MySpace and creates HisSpace or something like that. The purpose is to claim “space” in the name of God. The second response I see is the “Guardian” mentality. The Guardian is the one who is scaring the life out of people on radio, television, internet, and from behind the pulpit. “The ACLU is coming to get you! And if they don’t succeed, the other secularists will! And so, if you send $50 to our organization, “Keep God Where He Belongs”, you will do your part in making sure the omni-presence of God stays where it belongs, right here in America!” Yes, that is a caricature. Probably a better connection point is the common sentiment that the 1950’s were a very Christian and moral time in America and we need to get back to it. It’s the hope of Pleasantville and the personalities are the televangelists like Falwell, Robertson, Dobson, etc. You could say that the Guardian mentality is the generation (not 40 years of time but of mentality) after the Conquistador. They quote Paul and the Founding Fathers in the same breath. That’s a problem for the Christ-follower who claims to be seeking the Kingdom of Jesus. Succeeding the Guardian is the Debater/Protester/Activisit. This person is a combination of the Conquistador and Guardian. They are (re)claiming something and guarding something else. In the political world, it could be Ann Coulter. In the subversive Christian world, it could be a Shane Claiborne. (By the way, this is the only time in the entire internet that those two names will be found in back to back sentences). This person is typically passionate and prophetic. To its extreme, this person is the assassin. The final Christian response to the culture war is the “Private Apathetic”. This is the person who has more or less seen the gravity of the situation, has fired upon others in the culture war, has been fired upon and has been wounded. This person has regretted hurting others and being hurt and has consequently abandoned the fight. Some have retreated deep within the Christian sub-culture and filled their days praying for the rapture while waving their finger of judgement at the decadent world. While others have abandoned any form of institution whatsoever and in some cases, forsaken Christian community as well, wishing only to worship God “privately”. What’s interesting to me is that most of us have dabbled in all four mentalities at some point, some at the same time. Now, I am not saying that there is no virtue in any of these. I am trying to draw broad strokes on a blog post here. Certainly there is a place for Innovators. Indeed, there is a time when we do need to guard important matters. There is a place for debate, protest (hello Protestant Reformation), and activism. There is also a time to retreat from the affairs of the world and find rest and renewal. I would contend that the work and the cross of Christ can be seen in these mentalities and more. I would also argue that the work and cross of Christ go much further and thus, so should we. I’ll pick up here in the next post. It was back in college (Liberty University) that I learned about the “Culture War”. I remember having to be convinced that there was one. Prior to that, I do not remember having many enemies. In the 90’s, I think I disliked two groups of people, abortion doctors and Red Sox fans ;-). Around that time, I only had a few problems, bad luck with girls, Greek (the language, not any frat reference. Come on, the context is Liberty University! ;-), and rock n’roll sucked. As I recall, in 1997, there were two songs on the radio, Matchbox’s 20 “Push” and Sugar Ray’s “Fly”. Oh wait, there was Chumbawaba and boy bands were about to take over the world. In response, I started listening to John Coltrane, Miles Davis and other classic jazz musicians. Anyway, I was informed that we were at war. I’m not talking about Ephesians 6 (Our battle is not flesh and blood …), but a war of competing ideologies, beliefs and values and the fate of the world rested on it. My real enemies were the ACLU, Bill Clinton and his Democrats, and Marilyn Manson. It was then that I started reading Chuck Colson’s Breakpoint, World Magazine and books by Cal Thomas and William Bennett. I was also very interested in apologetics and really believed that I could prove Christianity. So Ravi Zacharias, RC Sproul, and Phillip Johnson and on serious days, Gary Habermas and William Craig. I remember that summer reading Robert Bork’s Slouching Towards Gomorrah (which is an awesome book title) and thinking that I needed to be ready “to take a stand” and “hold the line” because a good Christian was a good soldier. Like all good soldiers, I was headed down the road of not questioning my superiors. The orders I was given were more of disposition and rarely of action (after all, we were evangelicals ;-) But as influential as Bork’s book was, I remember coming across a report where the ACLU represented a student-led after-school Bible study in a public school. What??? I knew that Jesus said, “a house divided against itself cannot stand” but was this something even more diabolical? I started seeing that things were a bit more complicated. Later I began understanding things like why many people had abortions (turns out, the white, affluent, liberal, career women represented a very, very, tiny percentage. It was lower-income minorities that comprised much of the stats.) And while that didn’t change my position on the topic of abortion, I started seeing the complexity of life, this world and God, Himself (including His mercy and justice). Later I stumbled across Addicted to Mediocrity by Franky Schaeffer which eventually led to the work of his father, Francis. Titles by C.S. Lewis and Peter Kreeft starting filling up my shelf and while I have always been and still remain conservative/moderate on most issues, the idea of objectivity (meaning that we as flawed, sinful people could actually be objective) was losing its grip on me. While I did not recognize it at the time, the idea of postmodernity was becoming a good thing and instead of seeing myself at war within my society, I started understanding the potential virtues of plurality and the power of relationships and conversation.